The Alpesh Patel Special Edition of ShareScope is a series of systems that I have used for many years, developing my own stock-picking filters and analytic settings ("radars"), and which has proved consistently successful for me. I want it to save you hours and hours of searching for trades and make you much more than it costs. It has done that for me! I have used this system for years now to target 25% growth per annum. It's important to stress the word TARGET. I set my sights high. Each year, I published a basket of stocks for a 12-month buy and hold. In fact, all I did was list the stocks in my Alpesh Patel Value/Growth filter on the day I gave the tips. Using this method I have achieved an average return of 18.2% over the last 5 years. Not 25% but I'll take 18.2% every year and I'm sure you would too. The FTSE All-Share provided an average 6.3% gain over the same period. Now, the Alpesh Patel Special Edition does not pick sure-fire winning trades and investment ideas every time. It picks trades and investment ideas that already meet specific criteria that I require as a starting point. These are criteria which I have settled upon over years of investing and shorter-term trading. I may still find reasons not to like some of the opportunities highlighted by my filters but I will tell you the warning signs that I look for. In today's market, people want the safety of buy and holding good quality stocks, but the extra performance of mild leverage that CFDs and Spreadbetting offers. But you do not need to go to extremes to achieve this. 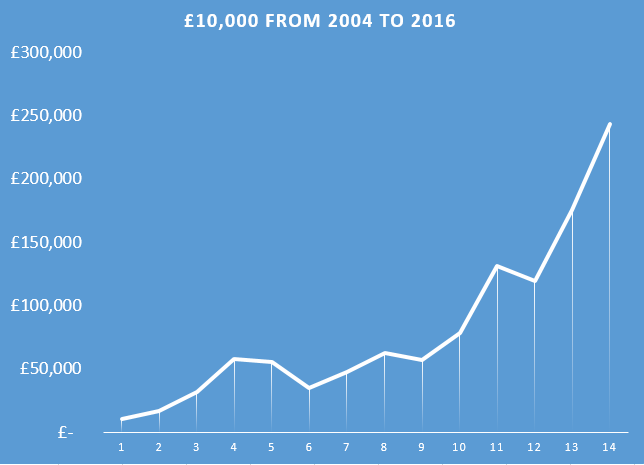 If you take the APSE performance since inception, and had just 2:1 leverage, then £10,000 turned to £250,000! I wanted a system that allowed the benefits of buy and hold but also great performance and this is how in the modern world of how we all invest now it should be measured. Of course even with no leverage the performance is outstanding. Note: trading with leverage not only magnifies your potential profits but also your potential losses. Alpesh Patel Special Edition is an UPGRADE to ShareScope and costs just £199 per year. The Alpesh Patel Special Edition is a set of stock screens and auto-generated comment devised by Alpesh Patel alone. ShareScope identifies matching stocks based on Alpesh's criteria only. Alpesh Patel is an FCA-authorised investment manager. Click here to see the seven ways I look for opportunities. My newsletter summarises the hours and hours of research I have done for the month ahead and has the best of the research from everything I have read from all the private banks, Bloomberg and hedge fund sources. I only subscribed to your Special Edition of ShareScope a week or two ago and have already made a couple of thousand on two of your investments - needless to say I am delighted as this has more than covered the cost of your Special Edition and put a bob or two into my pocket - Thank you. I use the Special Edition of ShareScope, utilising your systems...pleased to say that it is proving to be profitable for me. Alpesh's insight to the markets and trading are a must read for traders of all levels including beginners, there is something for everyone. Find out how one of the UK's best known traders and broadcasters uses the wealth of information out there. Alpesh's proven track record speaks for itself. Learning from him will help ordinary people match the results of market professionals. Takes a no-holds barred approach to uncovering stock market secrets, and searches for the truth that most financial TV coverage keeps well hidden...a brave guide that will help any stock market investor navigate the muddy waters of financial reporting - a sort of Columbo meets Warren Buffet. Genuinely attempts and succeeds in giving the tools to convert a private investor to a professional investor for today's "Holy Grail" obsessed market. The lid of the traders' black box has finally been well and truly removed. This is great. A magnificent job. The Mind of a Trader successfully captures the character of its subject, with Alpesh's insightful commentary. Alpesh is a born authoritative commentator and always insightful news editorial contributor. I miss the time when his FT column on online investing was my incentive to buy the weekend edition. Gets to the heart of the matter of trading by clearly elucidating the methodologies of successful trading strategies while capturing the ineffable ethos of singular, successful traders. Long overdue and very, very welcome. Seasoned traders and new investors alike will learn much from Alpesh Patel's "no nonesense" guide to the industry. ...one of the savviest traders around. Read [Investing Unplugged] and you are guaranteed to be a better investor. An essential companion for the online trader. Let this veteran trading warrior show you how to survive and thrive with his latest internet guide. At last someone brave enough to explain trading clearly. The Internet Trading Course is the best guide of its kind to personal investing and will satisfy the beginner and the professional. The Internet Trading Course gives you an insight into making the markets work for you. Insights into online trading from one of the leading authorities in the field. Alpesh provides as ever as the leading authority in his field clear and concise guide to making profits from proven trading strategies. Alpesh clearly brings to life the difference between what analysts and the media "spin" and what you should trust.